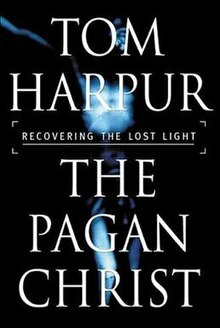 The Pagan Christ: Recovering the Lost Light is a 2004 non-fiction book by Canadian writer Tom Harpur (1929-2017), a former Anglican priest, journalist and professor of Greek and New Testament at the University of Toronto, which supports the Christ myth theory. Harpur claims that the New Testament shares a large number of similarities with ancient Egyptian and other pagan religions, that early Church leaders fabricated a literal and human Jesus based on ancient myths, and that we should return to an inclusive and universal religion where the spirit of Christ or Christos lives within each of us. The book was named the Canadian non-fiction bestseller of the year by both the Toronto Star and The Globe and Mail. It was later released under the title The Pagan Christ: Is Blind Faith Killing Christianity? in the United States by Walker Books and in Australia by Allen Unwin. It has also been published in five foreign languages: in Montreal (Le Christ païen) by Éditions du Boréal, in the Netherlands (De heidense Christus) by Ankh-Hermes bv, in Germany (Der heidnische Heiland) by Ansata Verlag, in Brazil (O Cristo Dos Pagaos) by Editora Cultrix-Pensamento and in Japan (異教キリスト) by Basilico. In 2007, the book became the basis for a CBC documentary, and that same year, Harpur published a more scholarly sequel entitled Water Into Wine: An Empowering Vision of the Gospels. Throughout the book, Harpur details stories and sayings in the New Testament which he claims also appear in ancient myths, particularly pointing out the similarities between Jesus and the Egyptian sun god Horus. He states that a number of pagan cultures in different regions and time periods drew on symbolic themes such as virgin birth, deity father, star in the east, raising of the dead, descent into hell, crucifixion, resurrection, and others. Harpur claims that virtually all words and actions attributed to Jesus in the gospels "originated thousands of years before." Although early church leaders such as Justin Martyr and St. Augustine reportedly acknowledged certain commonalities between pagan religions and Christianity, Harpur explains that the extent of these similarities was hidden until the discovery of the Rosetta Stone in 1799. According to Harpur, most modern biblical scholars agree the gospels were written many decades after the presumed death of Jesus, and he concludes the scriptures are inconsistent, inaccurate and do not represent a verifiable historical record. Harpur even makes the case that the original authors of the New Testament set out to combine popular pagan myths with prophecies of the Old Testament, never intending for readers to take these allegorical stories literally. In what he calls "one of the most far-reaching tragedies in history," he presents the case that the Christian church in the third and fourth centuries "made a fatal and fateful error," namely inventing the myth of a literal and historical Jesus based on "sublime truth." He further suggests that ultra-conservative Christianists "did everything in their power, through forgery and other fraud, book burning, character assassination, and murder itself, to destroy the crucial evidence." According to Harpur's sources, their propaganda included selectively editing the scriptures and inserting false passages about Jesus into the text of the Jewish historian Josephus. Asking the question, "can we say with any authority that Jesus of Nazareth actually existed as historical person", he concludes, "I have a very grave doubts we can," adding that his gradual realization that Jesus was a "mythical copy of many preceding saviours" was difficult to accept himself. Consistent with the Jesus myth theory, Harpur contends, "there is no hard historical evidence for Jesus' existence," and "no contemporary non-Christian writer even knew of Jesus." Noting his belief that the Pauline epistles or letters of Saint Paul (which were written before the four gospels), do not mention the parables and miracles of Christ, and make no reference to biographical details like Nazareth, Harpur concludes, "I am compelled, therefore, by my own independent research to agree that Paul's Christ was not Jesus of Nazareth." To that end, he states that biblical literalism "commits idolatry by making a flesh-and-blood man into God," and that worshiping a perfect superman with magical powers who supposedly lived 2000 years ago is not a sustainable path for the future of Christianity. On Harpur's website and jacket cover, The Pagan Christ is said to reveal "a cosmic faith built on these truths that the modern church has renounced", and calling for a "return to an inclusive religion where Christ lives within each of us." According to Harpur, he has spent his entire life searching for answers, and now that he understands the scriptures represent symbolic allegories on a central theme rather than cryptic history, God seems more "relevant and real," and "the Bible comes alive wholly in a new way." Instead of challenging his religious faith, Harpur attests that his discoveries "have made a joyous and life-changing imprint," which have "transformed my view of the future of Christianity it into one of hope." In December 2007, the Canadian Broadcasting Corporation aired a documentary called The Pagan Christ, based on Harpur's book, as part of its Doc Zone series. Filmed by Bank Productions, it was one of the most-watched television documentaries in Canada that year and received mostly favourable comments on the CBC website. The program won the Platinumo Remi Award at the Houston International Film Festival and the Golden Camera Award for best documentary at the U.S. International Film and Video Festival in Redondo Beach, California. The Pagan Christ joins a list of documentaries with sensational claims against orthodox Christianity that have originally aired before either Christmas or Easter, that includes Bible Secrets Revealed (November to December, 2013) and The Lost Tomb of Christ (March, 2007). In a 2004 article entitled "The Leading Religion Writer in Canada ... Does He Know What He's Talking About? ", Vancouver-based pastor W. Ward Gasque strongly critiques The Pagan Christ, claiming the "evidence for Jesus as a historical personage is incontrovertible." He reports that only one of the ten Egyptologists who responded to his emails (nine of whom were not identified) were familiar with Kuhn, Higgins and Massey, and that they unanimously dismissed an Egyptian etymology for Jesus. James A. Beverley, author and professor at Tyndale Seminary in Toronto, wrote a brief article in 2004 called "The Pagan Tom Harpur" for the Evangelical Fellowship of Canada, using a more light-hearted tone than the title suggested. Stanley E. Porter and Stephen J. Bedard offer a refutation of Harpur's ideas from an evangelical standpoint in Unmasking the Pagan Christ: An Evangelical Response to the Cosmic Christ Idea. The 2006 book from Clements Publishing challenges the key ideas lying at the foundation of Harpur's thesis. Porter, president and dean of McMaster Divinity College in Hamilton, and Stephen J. Bedard, a Baptist minister and graduate of McMaster Divinity, state, 'If the proponents of the Pagan Christ theory had any evidence even close to the quality of The Epic of Gilgamesh material, there would be some reason to consider their claims. Unfortunately for their arguments, their evidence lacks substance and the claims are, therefore, shockingly weak.' Porter and Bedard conclude that there is sufficient evidence for the historicity of Jesus and assert that Harpur is motivated to promote "universalistic spirituality". Porter appeared in the CBC documentary, and David Brady Productions approached the authors about creating a counter documentary for Canada's VisionTV in 2008. Porter's colleague at McMaster Divinity College, Gordon L. Heath, also produced a paper called "Neither Scholarly or a Solution" which offers a critique of the book. The author concedes he agrees with Harpur on several points such as their shared aversion to rigid fundamentalism and that the church has done shameful things in the past, but disagrees on most other points. In 2009, theologian and author Robert M. Price wrote a review which raised a number of concerns about Harpur's premise and evidence. Price noted that the book "contains many dubious fact claims". Bart D. Ehrman Professor of Religious Studies at the University of North Carolina at Chapel Hill on his ehrmanblog in 2012 and in his book published the same year, Did Jesus Exist? The Historical Argument for Jesus of Nazareth, lists Harpur along with other "mythicists" such as Price, but does not specifically criticize the details in The Pagan Christ. In 2013, New Testament scholar Craig A. Evans noted that the views of Harpur and Kuhn have been "thoroughly refuted and is not followed by any reputable historian or Egyptologist." ^ Tom Harpur, The Pagan Christ (Toronto: Thomas Allen Publishers, 2004), p. 10. ^ Felden, Emil (1918) [First published 1910]. Der Spiritismus und die anderen okkulten Systeme unserer Zeit. Leipzig: Oldenburg. ^ Felden, Emil (1914). "Felden Pastor an St. Martini Bremen" [Pastor of St. Martini Church, Bremen, Germany]. In Schmidt, Heinrich (ed.). Was wir Ernst Haeckel Verdanken (What We Owe to Ernst Haeckel): Ein buch der Verehrung und Dankbarkeit (in German). 2. Deutscher Monistenbund. Leipzig: Verlag Unesma G.m.b.H. pp. 125–128. testimony of Emil Felden in Was wir Ernst Haeckel Verdanken, vol. ii, p. 125. ^ Peter Christian Albrecht Jensen (1910). Hat der Jesus der Evangelien wirklich gelebt? : eine Antwort an Jülicher. Frankfurt am Main: Neuer Frankfurter Verlag. Google Books. ^ Harpur, Tom (1 October 2005). The Pagan Christ: Recovering the Lost Light. Dundurn. p. 101. ISBN 978-0-88762-829-0. Barnes was able to declare Jesus a mythical person, the product of the mythmaking tendencies common to religious people of all ages, particularly the period of the early Roman Empire. He lists Bruno Bauer, Albert Kaltoff, Arthur Drews, J. C. Stendel, Emil Felden, Jensen, Lublinski, Bolland, Van der berg, Charles Virolleaud, Ryner Couchoud, Gerald Massey, Emilio Bossi, Georg Brandes, John M. Robertson, G. R.S. Mead, Whittaker, Edward Carpenter, and W.B. Smith among the eminent scholars and critics who have contended that Jesus was not historical. ^ Barnes, Harry Elmer (1929). The Twilight of Christianity. New York: Vanguard Press. pp. 390–391. Among the more eminent scholars and critics who have contended that Jesus was not an actual historical figure we mention Bruno Bauer, Kaithoff, Drews, Stendel, Felder, Deye, Jensen, Lublinski, Bolland, Van der Berg, Virolleaud, Couchoud, Massey, Bossi, Niemojewski, Brandes, Robertson, Mead, Whittaker, Carpenter and W. B. Smith. ^ Steudel, Friedrich (1910). Wir Gelehrten vom Fach! : Eine Streitschrift gegen Professor D. von Soden's Hat Jesus gelebt? (in German). Neuer Frankfurter Verlag. The 'Jesusism' of the modern theology is fundamentally irreligious and itself presents the greatest hindrance to all true religious progress. ^ Bayet, Albert (1927). Les morales de l'évangile. Rieder. Jesus Christ did not exist and the morality of the Gospels, are from two different series of precepts belonging to different social groups. ^ a b "The Leading Religion Writer in Canada ... Does He Know What He's Talking About?". hnn.us. Retrieved 2015-06-19. ^ Stanley E Porter and Stephen J. Bedard, Unmasking the Pagan Christ: An Evangelical Response to the Cosmic Christ Idea (Toronto: Clements Publishing, 2006), 73. ^ "The EFC - The Pagan Tom Harpur". www.evangelicalfellowship.ca. Retrieved 2015-06-19. ^ Stanley E Porter and Stephen J. Bedard, Unmasking the Pagan Christ: An Evangelical Response to the Cosmic Christ Idea (Toronto: Clements Publishing, 2006), 69. ^ Neither Scholarly Nor A Solution: A Response to Tom Harpur's The Pagan Christ. Gordon L. Heath. ^ "Tom Harpur, The Pagan Christ: Recovering the Lost Light". Robert M. Price. ^ "Did Jesus Exist? The Birth of a Divine Man – Christianity in Antiquity (CIA): The Bart Ehrman Blog". ehrmanblog.org. Retrieved 2015-06-19.